Lymphoedema is swelling that develops as a result of injury or dysfunction of the lymphatic system. Although it tends to affect the legs and arms, it can affect any part of the body. Lymphoedema falls into two categories; primary or secondary. Primary Lymphoedema is an inherited genetic condition. Some, such as Milroy’s Disease are present from birth, others appear in teenage years and some do not develop until later in life. Genetic conditions can lie dormant until a relatively minor incident such as a sprain can trigger onset. Secondary Lymphoedema is the most common form and is often the result of injury, surgery or disease. As part of the immune system, lymphatic vessels and glands are responsible for removing waste, from soft tissue and bone and balancing the body’s fluids. It is this system which forms the vital first defence when infection strikes. 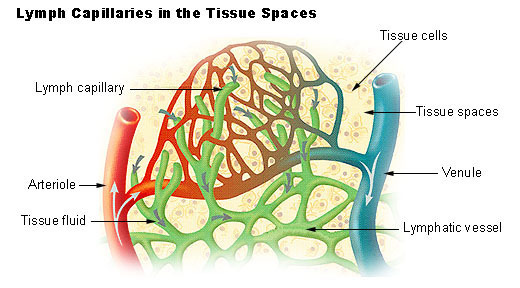 Lymphatic vessels are tiny and lie just under the surface of the skin. The fluid they carry, known as ‘lymph’ is transported in a “one way system” to larger vessels and then on to lymph nodes or glands around the body. These nodes form clusters in the neck, armpits, groins and behind the knees. Lymph nodes contain white blood cells called lymphocytes and antibodies that defend the body against infection. Here, the lymphatic fluid is filtered and cleaned before sending it to the bloodstream via large veins which sit at each side of the neck, just behind the collar bone. It is then sent to the heart to be pumped around the body with the blood supply to the kidneys, where it is expelled in our urine. Unlike our vascular system, lymphatic vessels have no pump and rely on movement of the body itself to contract the vessels. Lymphatic vessels or glands may have been removed surgically or they may fail due to illness or injury. In either case, waste fluid (lymph) cannot be drained away from the area of the body affected. (It is just like our household waste accumulating if the bins do not get emptied). There may only be slight swelling at first and maybe not all the time, the swelling may only be noticeable towards the end of the day. Early diagnosis and treatment is vital because Lymphoemeda itself may be an indicator of a more serious problem. It is important to help stop acute Lymphoedema progressing to the chronic stage where the swelling does not subside over night and the tension in the affected area becomes uncomfortable. If this stage is left untreated, the immune system becomes compromised with surrounding skin suffering repeated infections and localised tissues and areas drained by the vessels become diseased. Treatment is often long term, especially in genetic cases where the cause may not be identifiable or reversible. Although there are a limited number of medications available and certain bandaging techniques can help alleviate severe problems, Lymphatic drainage massage remains the mainstay of treatment for Lymphoedema. This gentle, rhythmic technique helps to drain the vessels of the lymphatic system and decongest swollen lymph nodes. Clients are often taught simple self management techniques but it is important that Lymphoedema is monitored by a health care practitioner on a regular basis. Lymphatic Drainage Massage – More about the lymphatic drainage techniques used at The Sport & Performing Arts Injury Clinic in Cumbria.